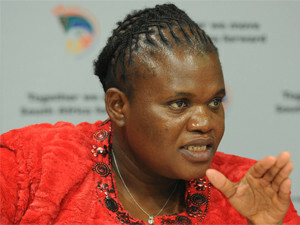 Despite the ruling, minister Faith Muthambi will be in Mpumalanga driving registration for free STBs on Friday. A Supreme Court of Appeal (SCA) ruling that communications minister Faith Muthambi's decision to use unencrypted set-top boxes is "unlawful and invalid" will not put a spanner in the department's digital migration process. In a statement, communications ministry spokesperson Mishack Molakeng says: "The Supreme Court of Appeal has not ordered the reversal of the Broadcasting Digital Migration policy, or interdicted the implementation of this key national project." Molakeng adds: "Noting this judgement, on Friday 3rd June, minister Muthambi will be in Kwaggafontein in Mpumalanga driving registration for set-top boxes for qualifying television-owning households." The department did not provide further clarity on whether it plans to seek further litigation on this matter. Yesterday, the SCA ruled in favour of Etv's appeal against the adoption of Muthambi's controversial Broadcasting Digital Migration policy. The free-to-air television broadcaster challenged Muthambi over the use of unencrypted set-top boxes (STBs) for when the country finally migrates from analogue to digital television. Etv approached the court to have a provision set aside in the policy that says government-subsidised STBs would not have the capability to encrypt broadcast signals. Following last year's decision by the Pretoria High Court, which granted Etv leave to appeal government's digital terrestrial television policy, the appeal court found the amendment to the Broadcasting Digital Migration policy adopted by Muthambi did not follow a process of consultation and was irrational and in breach of the principle of legality. The court also found the minister's failure to consult with Etv, the Independent Communications Authority of SA, the Universal Service and Access Agency of SA (USAASA) and other interested parties, rendered the process of enacting the amendment irrational. Etv's attorney, Aslam Moosajee, who is a director at Norton Rose Fulbright, told ITWeb: "The provision in the digital migration policy that suggested government-subsidised set-top boxes cannot have encryption capability has been set aside." Click here to read the full judgment (PDF). Etv is not the only entity to challenge Muthambi's decision to adopt the digital migration policy that uses unencrypted STBs. Last year, Muthambi's department was embroiled in a public spat with the African National Congress' (ANC's) Jackson Mthembu. In 2013, the ANC resolved to use encrypted STBs for the country's migration; however, Muthambi went against the ruling party's mandate and decided to adopt unencrypted decoders. It was reported that the minister would be forced to reverse her digital TV policy after disobeying the ANC's resolution. The department, however, dismissed claims its policy was up for reversal. Pay-TV providers normally use encrypted decoders to ensure subscribers that have paid their subscriptions receive their broadcasts. Free-to-air television broadcaster Etv called for encrypted STBs because it says these decoders are "essential to its business plans". In a statement, Etv welcomed the ruling, saying it hopes the clarity it provided will aid in providing a proper approach to the implementation of digital terrestrial television migration. Mark Rosin, COO of Etv, reiterates the channel's stance: "We are committed to the DTT platform, but want it to happen in an inclusive and organised manner. This ruling allows the possibility of a strong and stable DTT platform to South African free-to-air television viewers offering the best local and international content." Although the DOC began the registration process of qualifying TV-owning households for free set-top boxes last year, reception has been slow. To date, 14 000 households have registered, according to the department. Last September, the DOC placed the first order of STBs with USAASA. The DOC ordered 1.5 million unencrypted STBs, as part of government's plans to subsidise five million poor TV-owning households by providing free STBs. In her budget vote last month, Muthambi admitted there had been slow registration take-up by citizens due to the TV licence requirement. The minister stated that with agreement from SABC management, the TV licence requirement for the STB subsidy registration process had been removed. SA has been planning for digital migration since 2008 but last June missed the International Telecommunication Union's deadline.